To replace the Ouragan, Dassault developed simultaneously the Mystere II (170 of which served for 3 years) and the Mystere IV which was a superior product. The prototype of the Mystere IV was first flown on September 28, 1952 followed by 8 pre-series and 411 production aircraft. The US financed 225 of these machines to provide assistance to France during this period of the Cold War and they continued to monitor these aircraft until they were retired from service. The Armee de l'air received the first of its 242 Mystere IV A's in 1955. The Mystere IV A had a reputation of being pleasant and accurate to fly, which explains its use for aerobatics and flight training. Due to its high fuel consumption it was however limited in range and lacked thrust. This was why after the first 111 aircraft the British designed Tay engine was replaced by its higher thrust derivative, the Hispano-Suiza Verdon. From the early 1960's the aircraft were progressively relegated to the ground attack role for which their performance remained very adequate. Others were transferred to Cazaux for familiarising young fighter pilots with high performance aircraft after having finished their courses on the Fouga Magister and the Lockheed T-33. They were replaced in this role by the Alpha-Jet in 1982. 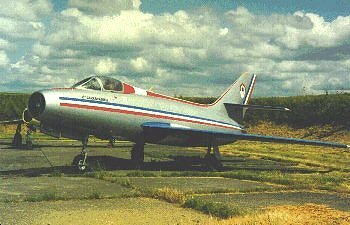 The Mystere IV served with 14 squadrons, 2 operational training centers and the Patrouille de France aerobatics team (1957-1963). The Ailes Anciennes Mystere IV was transferred from Cazaux as a donation of the US Air Force Museum in 1983.